Last month, on my birthday (for which Disney was kind enough to throw a Monstrous Summer All Nighter event for me! ), I got into the park shortly before midnight and met up with some friends. Given the hour of the evening, it seemed only fitting to ride the Haunted Mansion, as we were about to creep past the normal end of Disneyland's operating day and into typically uncharted operational territory. 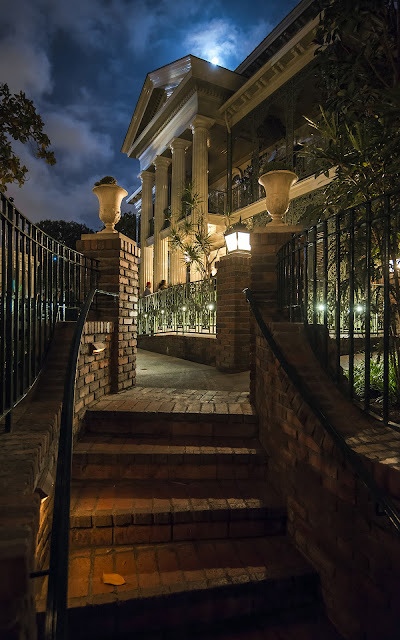 So we waited in line--much less than I was expecting--and, as usual, experienced a fun and uproariously spooky jaunt through this home of 999 happy haunts. But when I came out, I happened to glance up to my right, back at the mansion, and beheld this ephemeral sight. The moon, so illuminating and bright, was breaking over the clouds, casting a shimmering blue glow down onto the Haunted Mansion below. It felt like a fitting composition for one of my favorite rides, so I stopped and snapped a few frames. What wonderful atmosphere which can befall the park at night! Thanks! There's something about this photo that really appeals to me too. Or something about the composition, which is why it totally caught my eye when I walked out of Mansion!